Nearly three decades ago, journalist and educator Joel Garreau coined a new term, “Edge cities,” to describe the rise of commercial centers outside the downtowns (central business districts or CBDs) largely of the United States (Note 1). Many earlier edge cities followed the higher CBD building density model that reached its zenith in New York’s Manhattan and Chicago’s Loop. Before the automobile became dominant, as early as the 1920s, there was a premium on minimizing distances for commuters between their transit stops and work places. 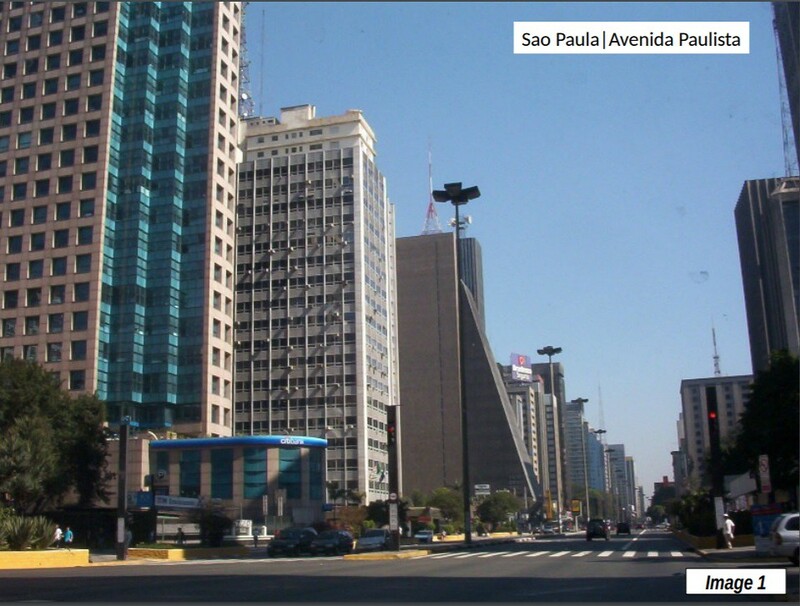 Some of the earlier edge cities followed this model, such as Clayton in St. Louis and Avenida Paulista in Sao Paulo (Image 1), where buildings literally rise from the sidewalk. Most later edge cities such as La Defence in Paris or the Energy Corridor in Houston, however, either have the broad expanses of a US suburban office park or have considerably lower building densities than the CBDs built for mass transit. 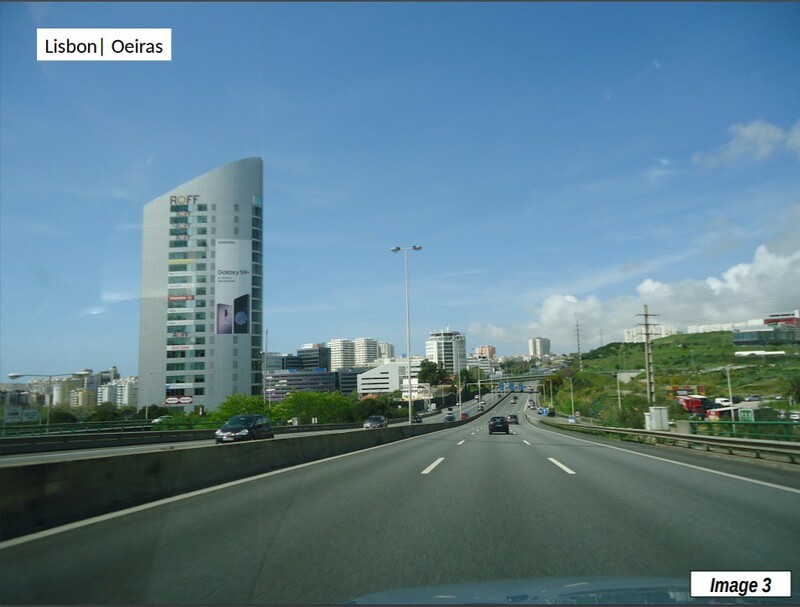 The trend that Garreau identified has spread to major urban areas around the world. 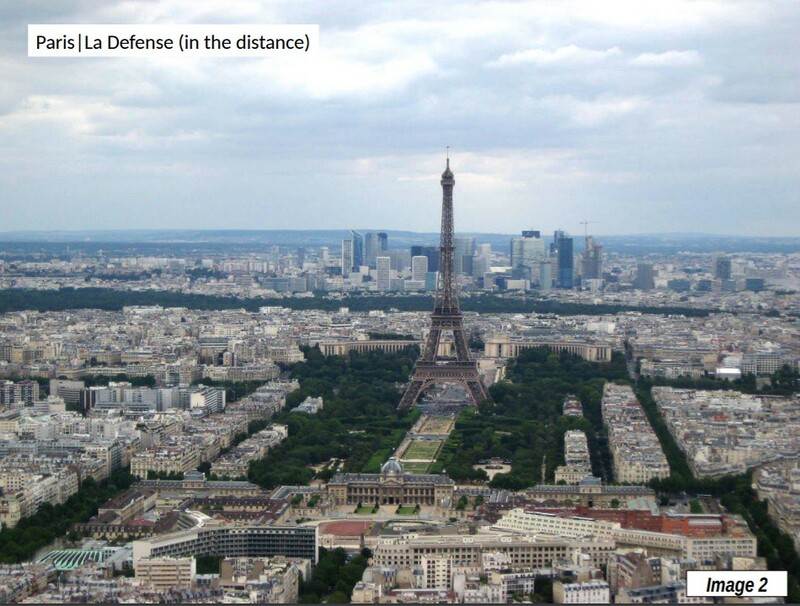 Many of the edge cities are located in other high income world cities, such as La Defence (Image 2, in the distance from the Eiffel Tower) in Paris, Canary Wharf in London, North York in Toronto, Oeiras in Lisbon (Image 3) and the newly developing Quarry Park in Calgary. But edge cities have also been built in middle income and even lower income countries. 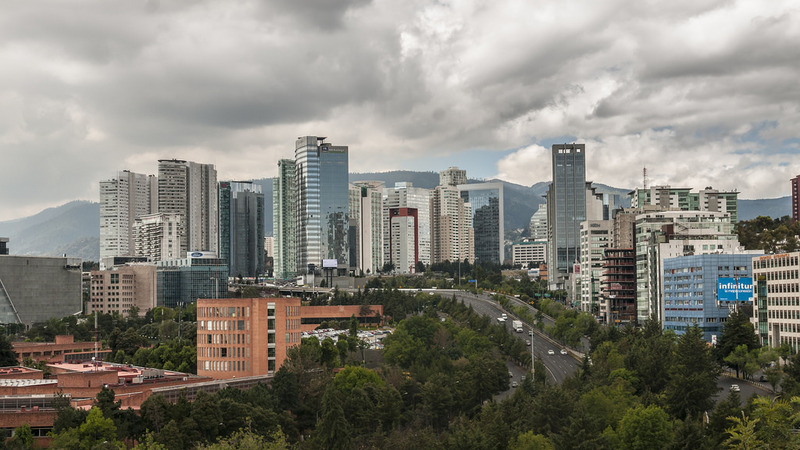 Mexico City had one of the first, Reforma and then added Santa Fe. 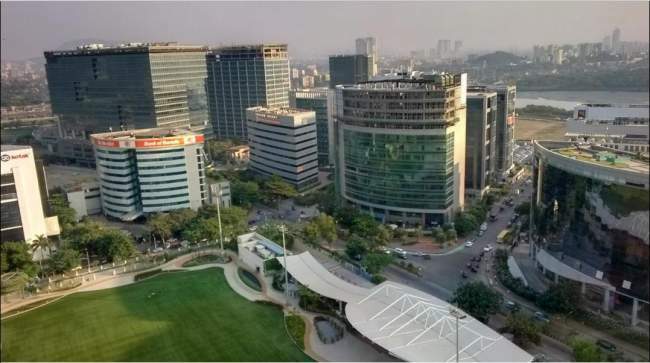 There have been many more, such as Providencia in Santiago (Image 4, Note 2), Avenida Paulista and Luis Berrini in Sao Paulo, and Bandra Kurla in Mumbai. 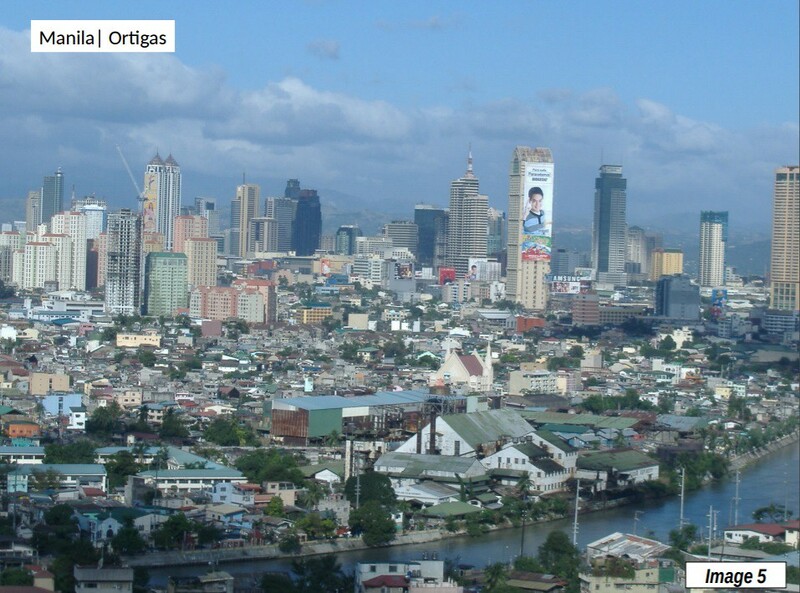 Manila might be called the Houston or Atlanta (even though it is much larger) of the Orient for its edge cities like Makati (Image 5), Ortigas (Image 6) and Filinvest City. 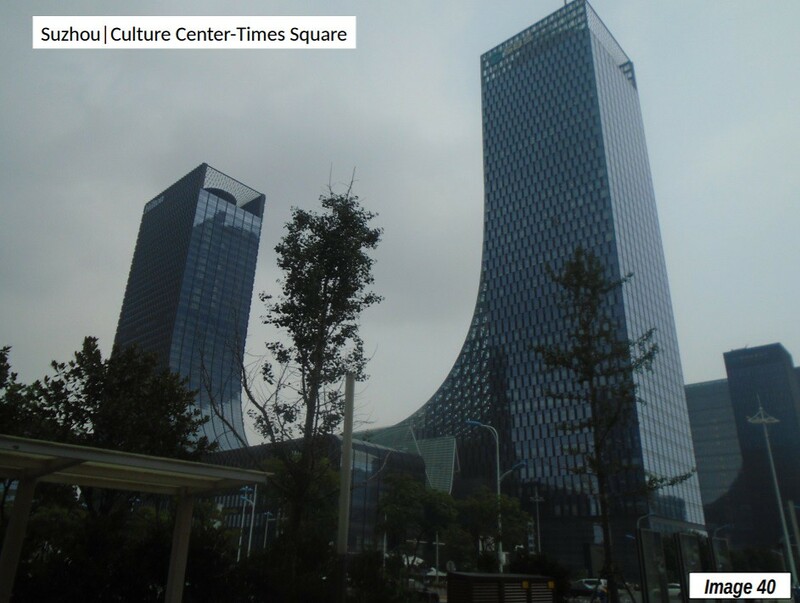 Edge city development has been prodigious in China. This should come as no surprise, with China’s monumental use of concrete and steel in building an urban fabric unprecedented in history. Bill Gates notes in a book review that China used nearly 50 percent more cement in just three recent years than the US used from 1901 to 2000. 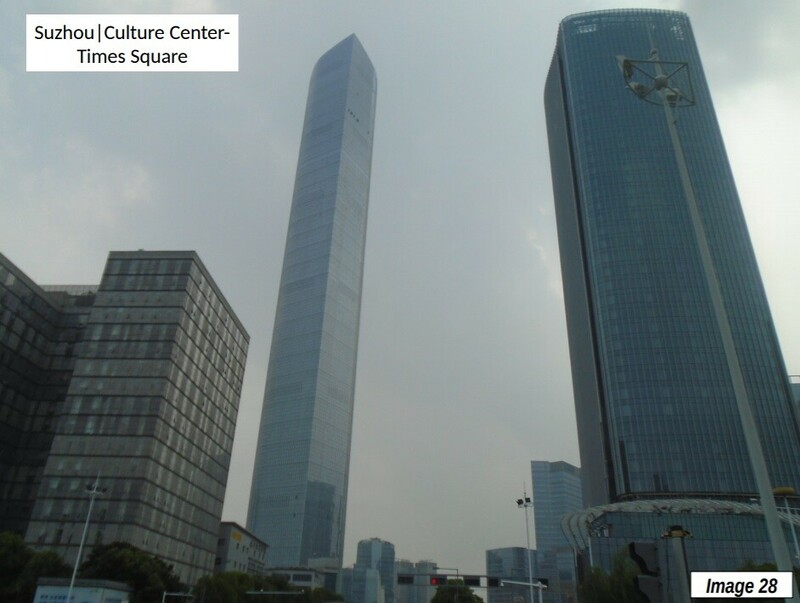 I have visited at least 25 office or mixed use based edge cities in China over the last decade or so. 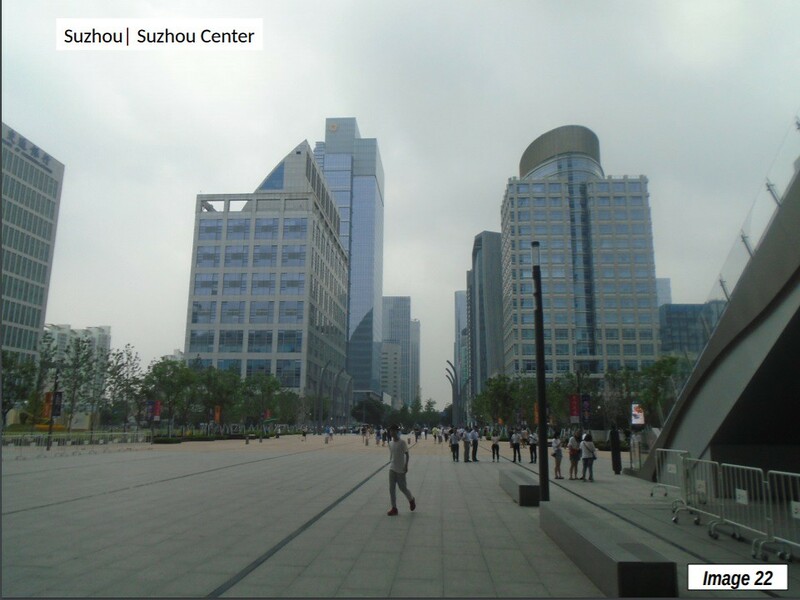 As elsewhere, edge cities have grown up in a wide range of urban areas, from the largest, like Shanghai, Beijing and Guangzhou-Foshan to much smaller Xining (Qinghai), with only 1.4 million residents. However, industrial edge cities, not considered here, may have contributed as much or more to China’s economic advance (Note 3). 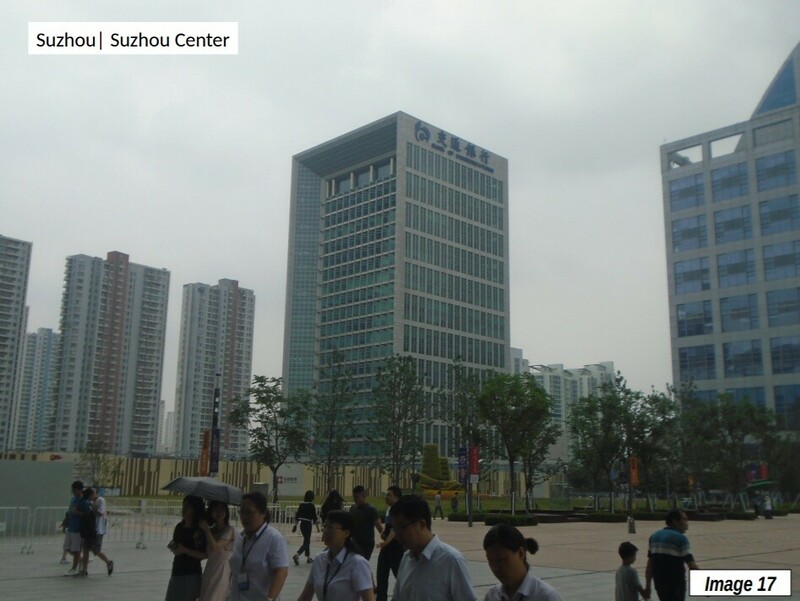 This article reviews two of the most significant office or mixed use edge cities in China, in Suzhou. 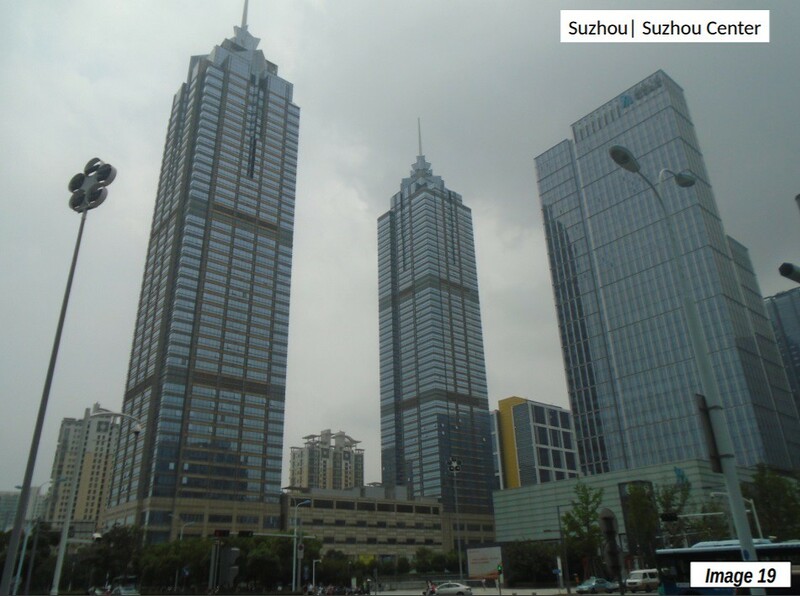 Suzhou is a large municipality (prefecture) that borders Shanghai on the west. It is on the Yangtze Delta (home to more than 100 million people) and is a well-known tourist center for its canals, picturesque bridges, Tiger Hill Pagoda and UNESCO world heritage gardens (See: “Suzhou: All of China in One Place” 2008). 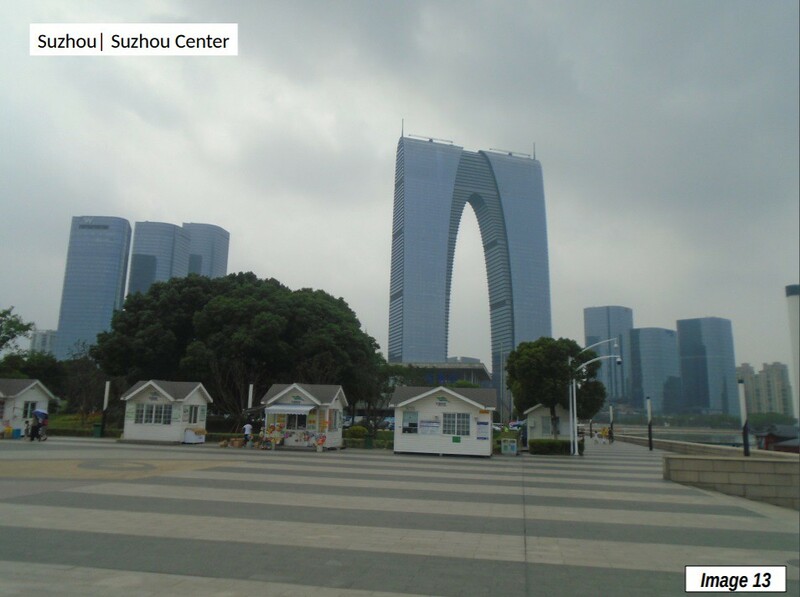 Suzhou has more than 10 million residents and covers 6,100 square kilometer (2,350 square miles). This approximately the same population as Los Angeles County, with a land area one-half as large. 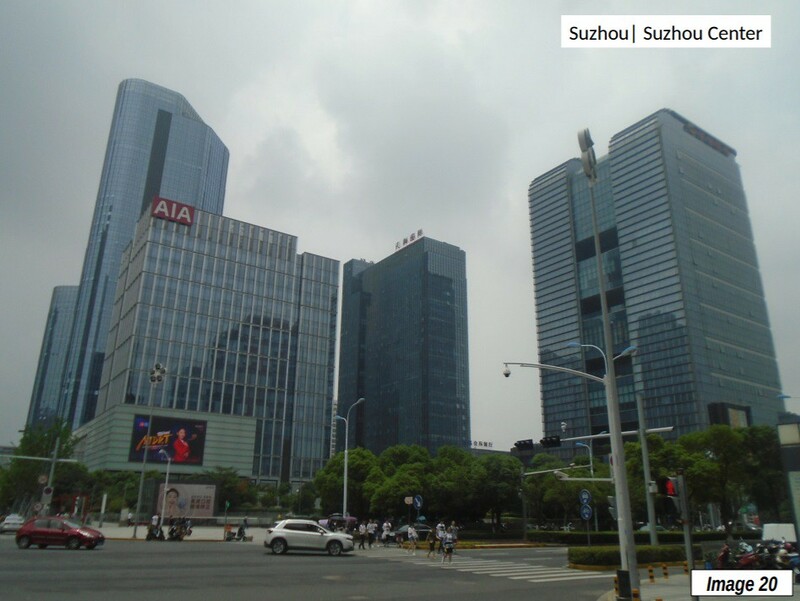 The Suzhou municipality includes four large, continuously developed urban areas, Suzhou (6.2 million), as well as three other urban areas with more than 1,000,000 population, Zhangjiaggang, Kunshan, and Changshu. 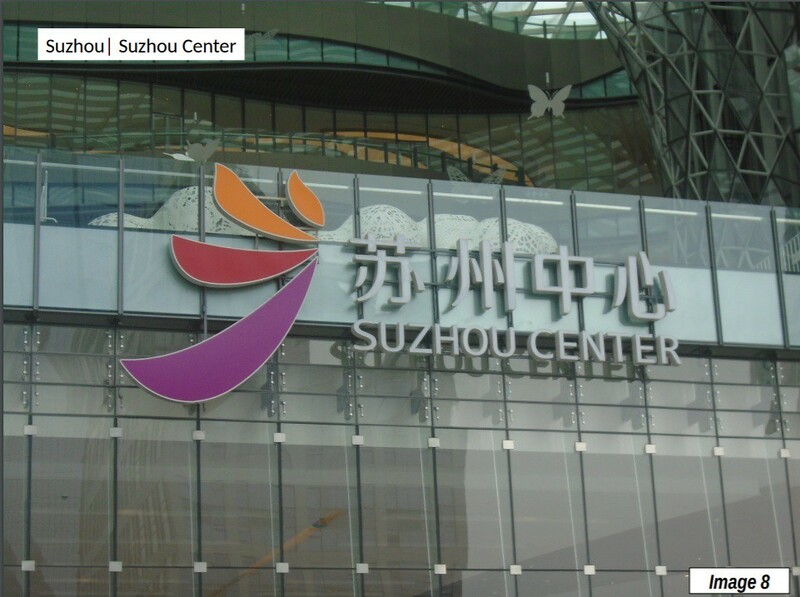 The core of Suzhou (Suzhou station) is as little as 25 minutes by frequent high speed rail service from Shanghai Station, adjacent to the CBD. The 100 kilometer trip (60 miles) costs approximately $6 one way second class (recommended) or $9 first class. 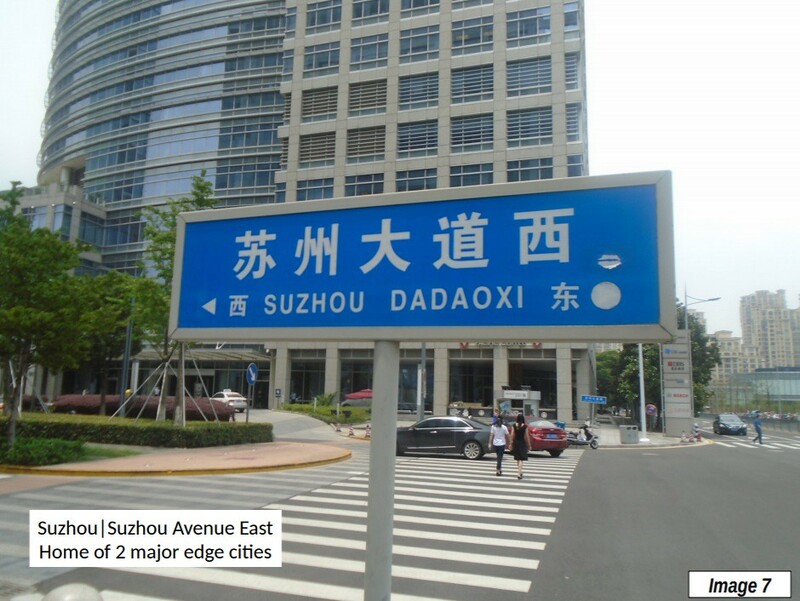 Two edge cities are examined in the Suzhou urban area, both of which can be reached by Suzhou Rail Transit from Suzhou Station (or the more distant Suzhou North Station, built on the new Shanghai to Beijing high speed rail main line). 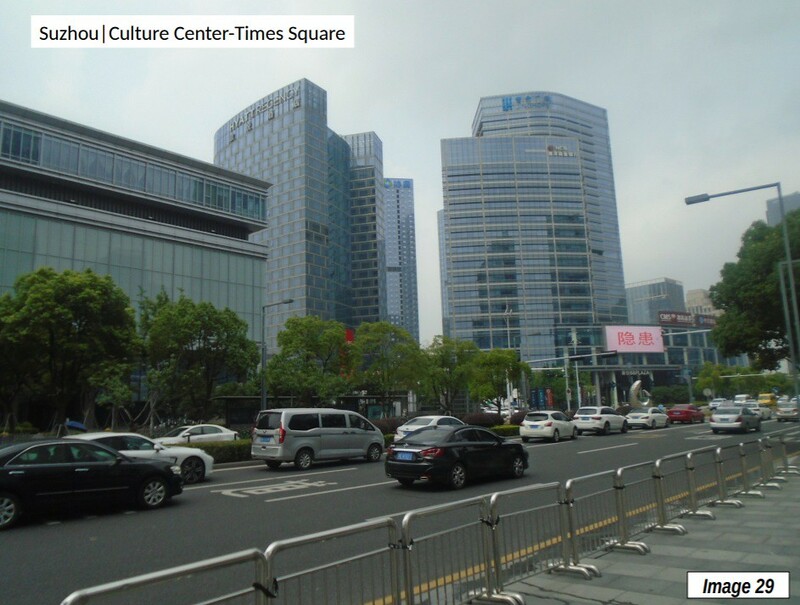 These centers are among the world’s most impressive edge cities, separated by a lake by about 1.6 kilometers (one mile), both along Suzhou Avenue (Image 7). 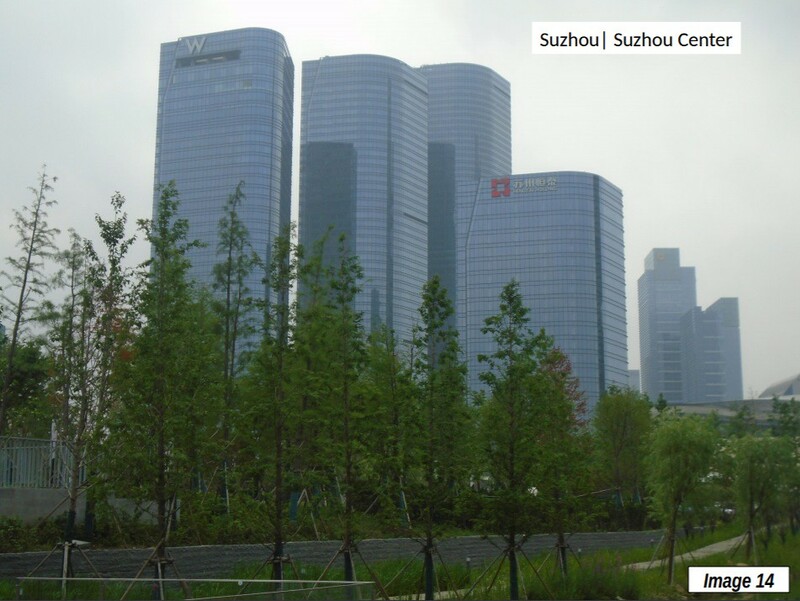 The Suzhou municipality has other edge cities, both in the Suzhou urban area, and other urban areas. 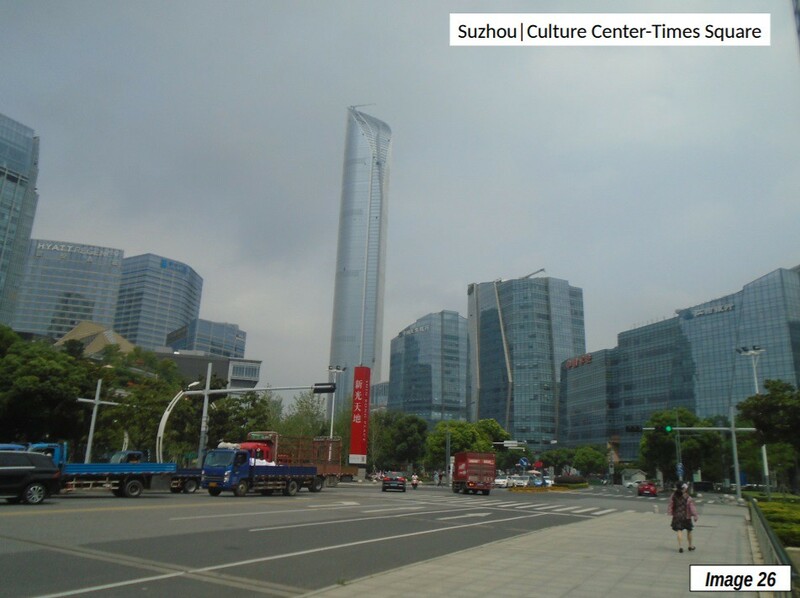 The Suzhou Center edge city is around the Suzhou Center shopping center (Images 8 & 13). 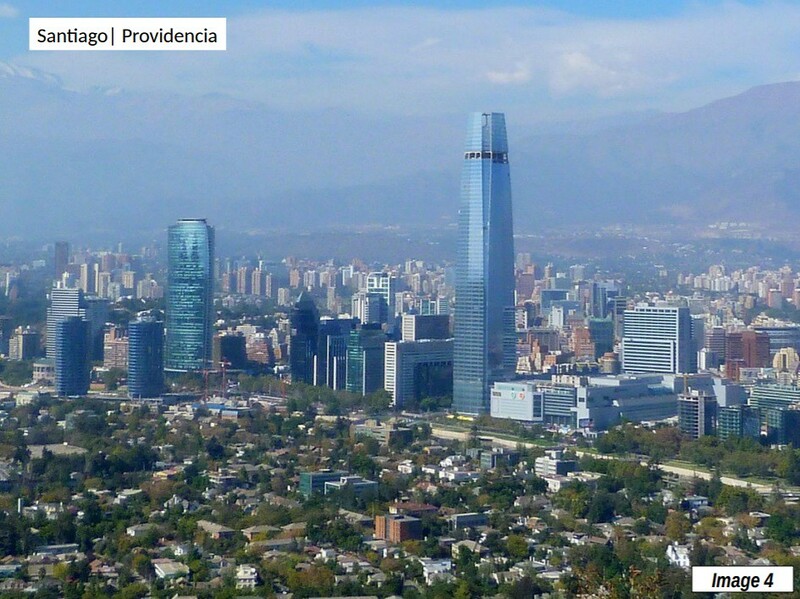 It is located approximately 8 kilometers (5 miles) directly east of the traditional urban core (Images 8-22). 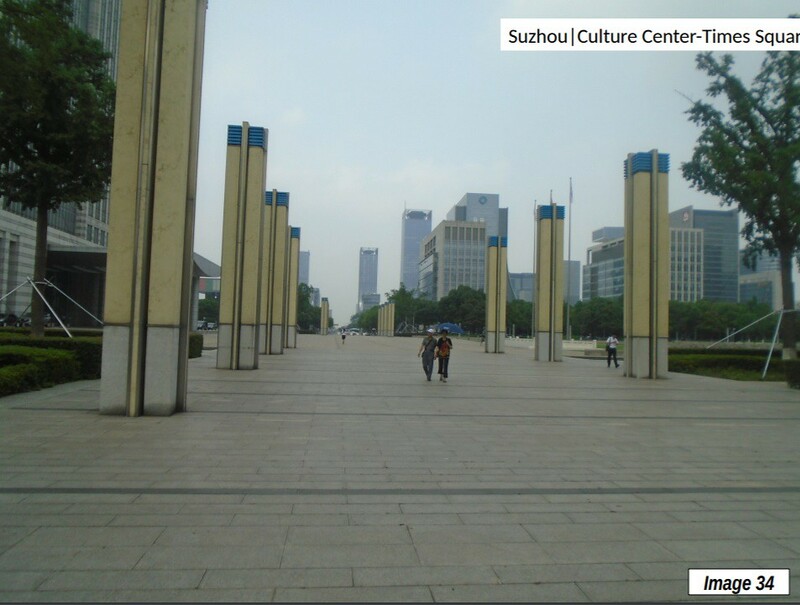 Served by two Suzhou Rail Transit stations (Xinghai and Dongfangzhimen, also called the Gate to the East), Suzhou Center is 1.9 kilometers long (1.2 miles), stretching from Central Park to Jinji Lake. The development covers approximately 1.1 square kilometers (0.4 square miles). This is about one-half the land area of the Tampa CBD. 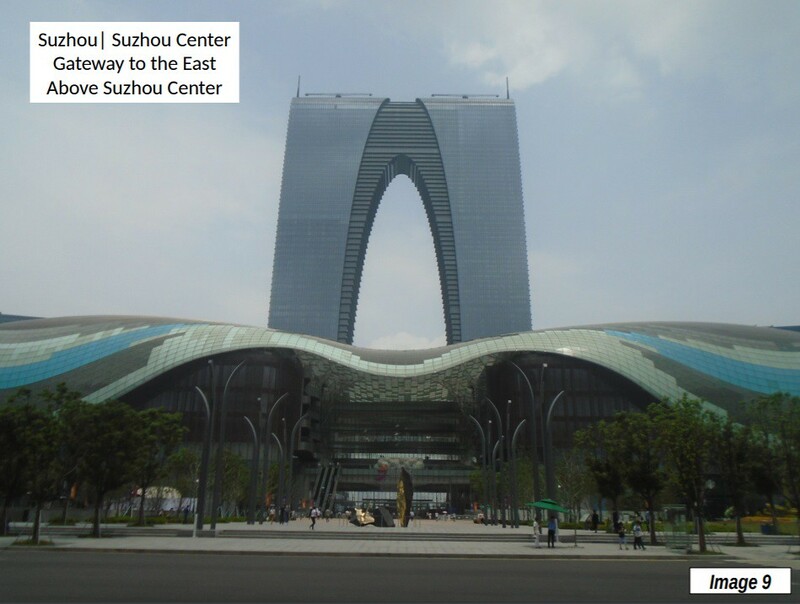 The Suzhou Center edge city is anchored by the “Gate to the East,” with 450,000 square meters of space (4.8 million square feet). The Gate to the East is the 128th tallest building in the world, with 66 floors above the ground rising to 302 meters (990 feet). 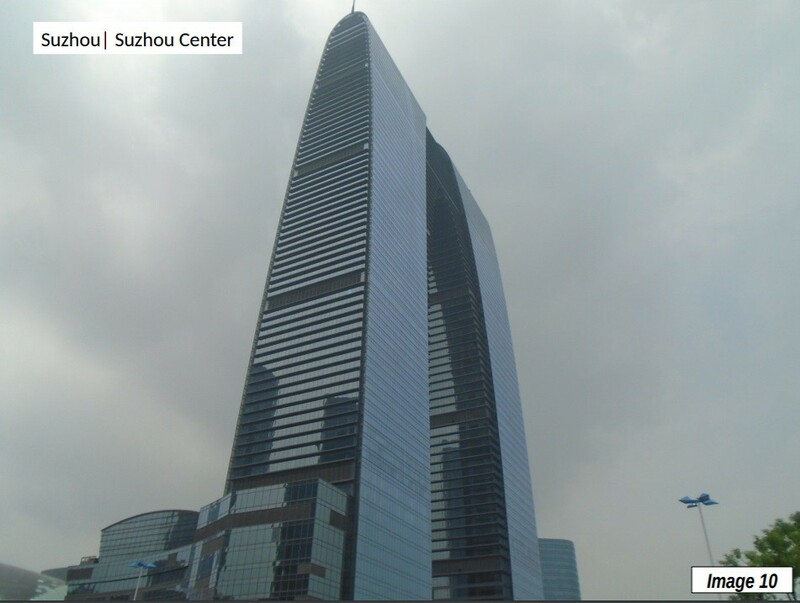 The building is on top of the Suzhou Center shopping center (Image 9). 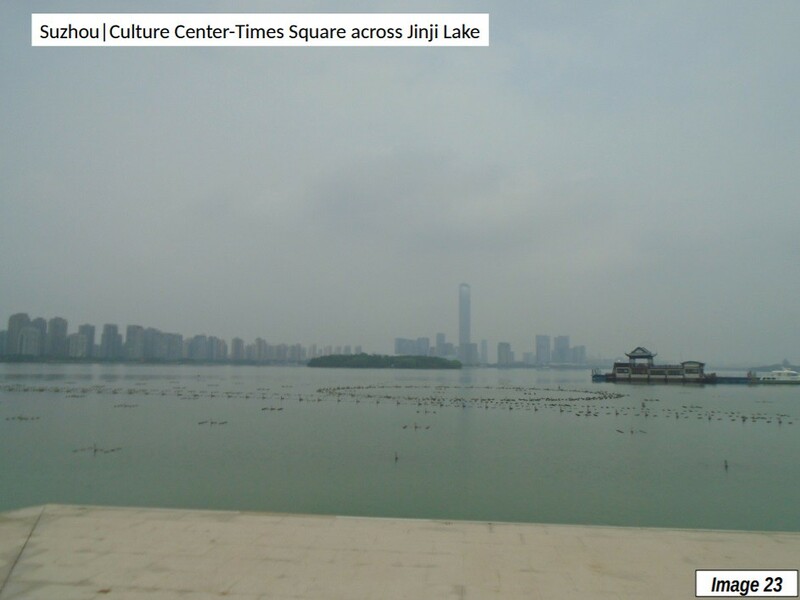 The Gate to the East is located across Jinji Lake from the Culture Center-Times Square edge city (Images 9-11, 13, 15). 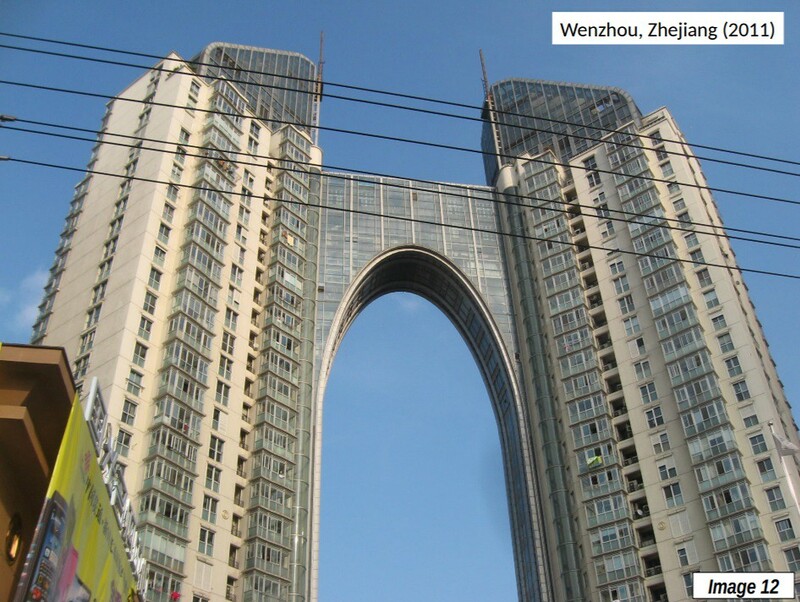 The Gate to the East is a distinctive design that has been criticized by locals as the “giant underpants.” Its design is similar to that of an older building in the CBD of Wenzhou, in Zhejiang province (Image 12, a 2011 photograph). 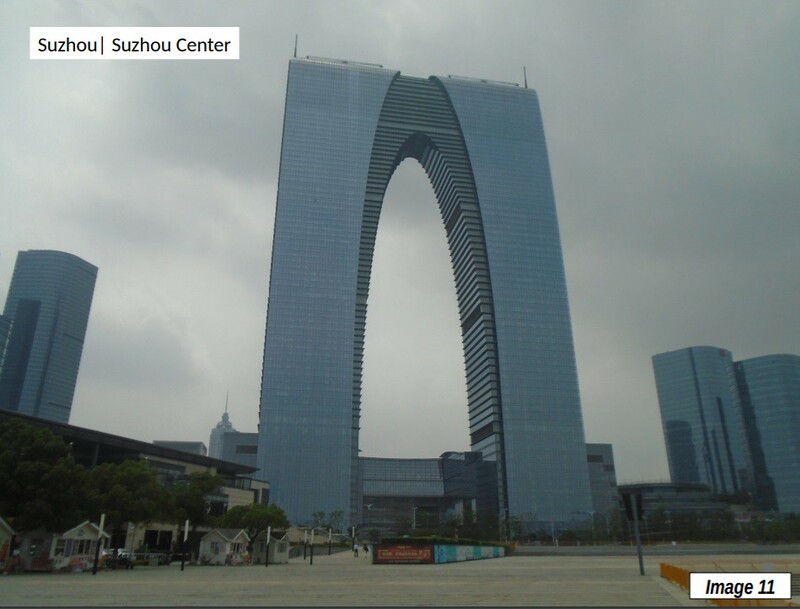 The Gate to the East is flanked by skyscrapers of varying heights but similar designs (Image 13). 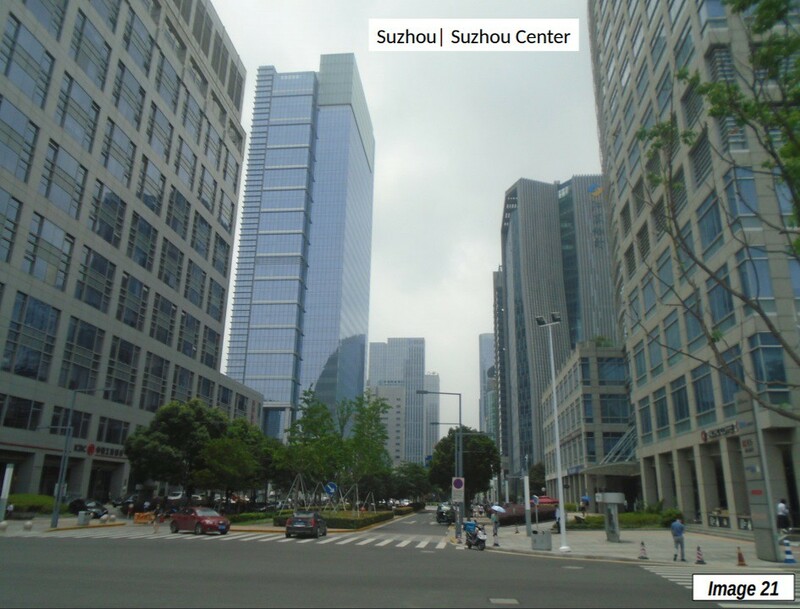 Most of the development is along Suzhou Avenue, in a corridor a few blocks wide (Images 14, 16, 18 & 22). 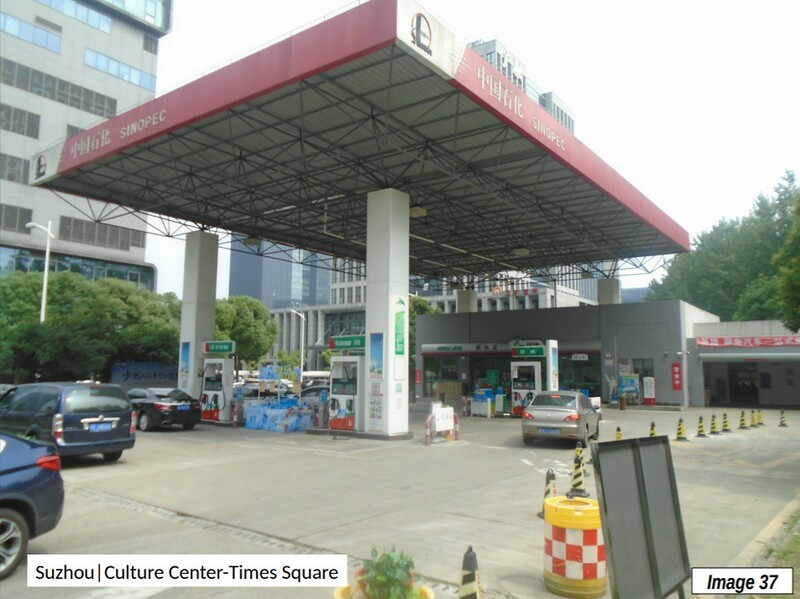 One subway stop east of the Gate to the East is the Culture and Education Center (Image), the western limit of the Culture Center-Times Square edge city (Images 23-40). 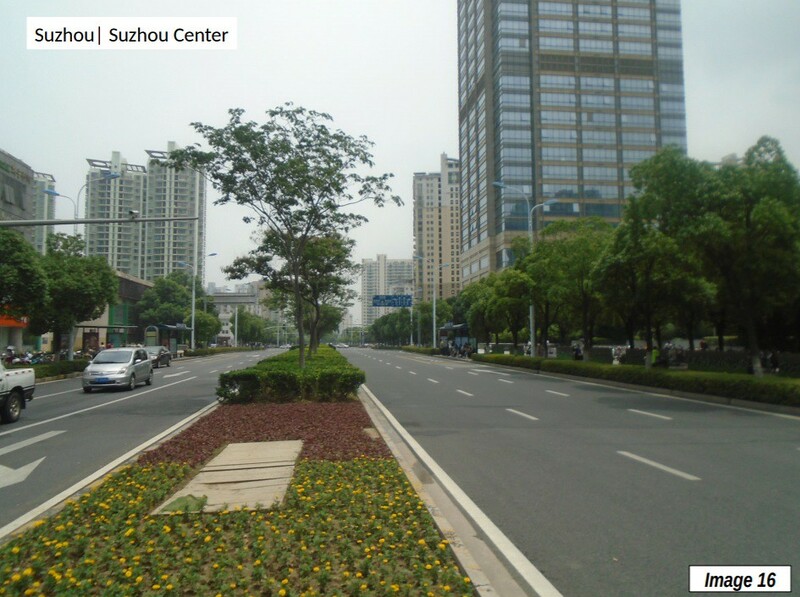 This edge city is linear and is also along Suzhou Avenue. 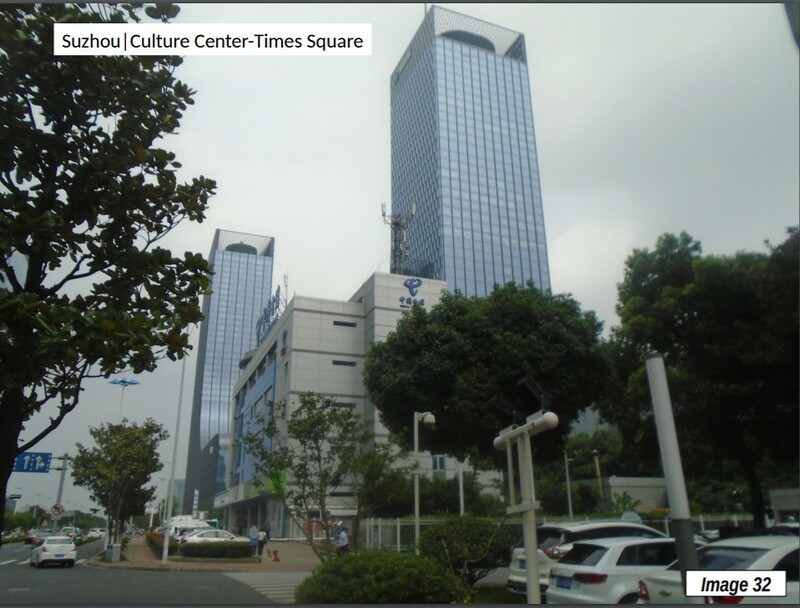 It has four subway stations, Culture and Education Center, Times Square, Xinghu Street, and Nansha Street. 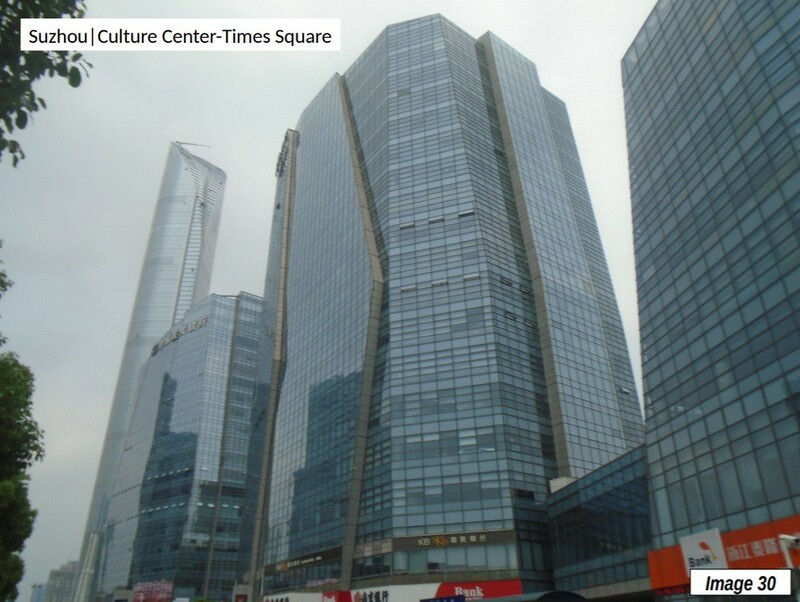 The Culture Center-Times Square edge city is 13 kilometers (8 miles) east of the urban core, and stretches for three kilometers (two miles) west to east. This edge city covers approximately 2.1 square kilometers (0.8 square miles), about the same land area as the Nashville CBD. 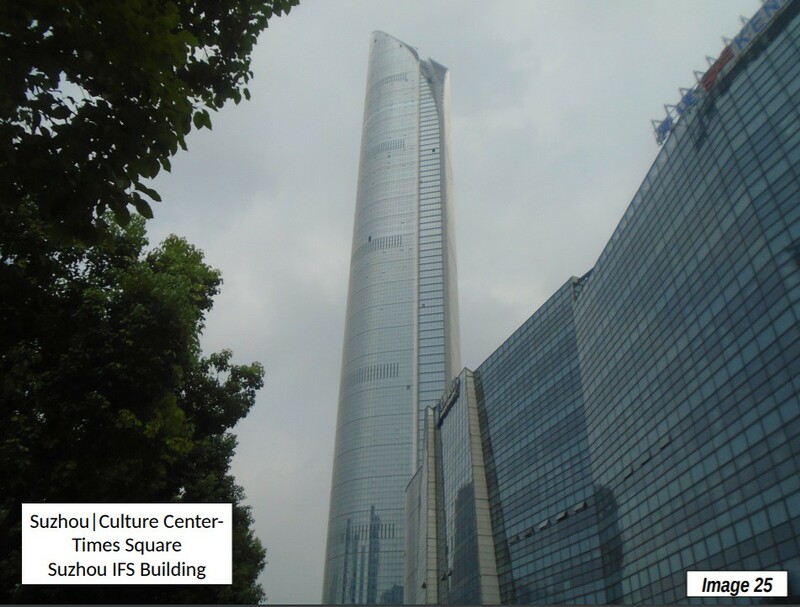 The Suzhou IFS building is the tallest in the Suzhou municipality, is located at the Times Square Station and will open in 2019 (Top photograph and Images 23, 25, 26, 28, 30). Already topped out, it is 450 meters tall (1,476 feet), about the same height as the Sears Tower (now Willis Tower) in Chicago which was the tallest in the world from for about 25 years. 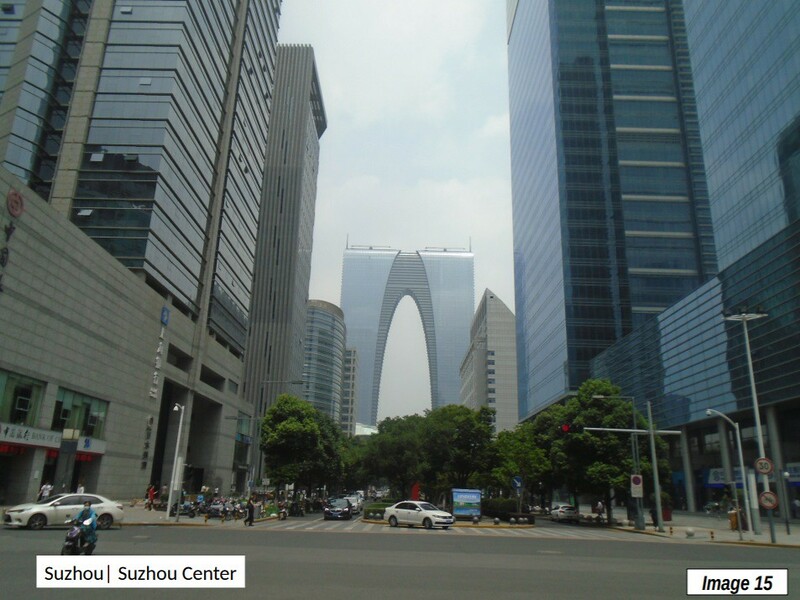 Suzhou IFS tops the Gateway to the East by 50 percent. 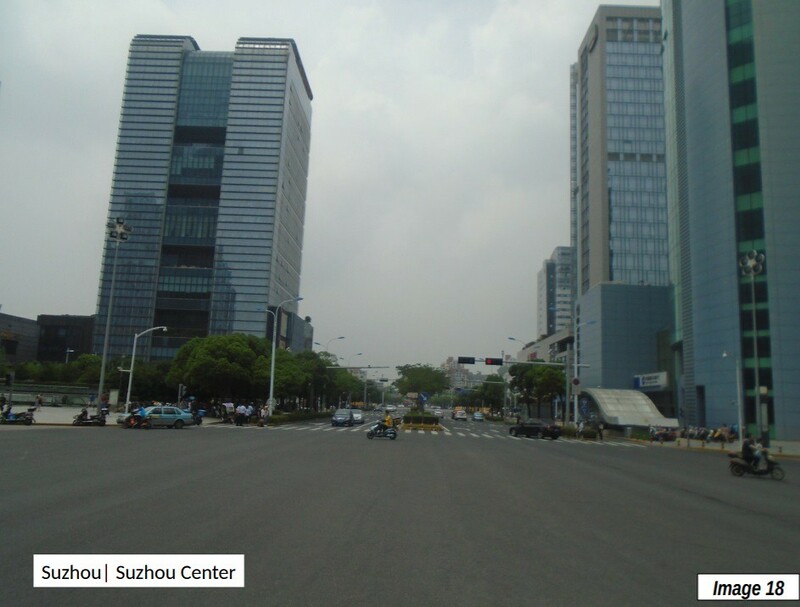 However, Suzhou IFS will have considerably less floor space at 278,000 square meters (3.0 million square feet). 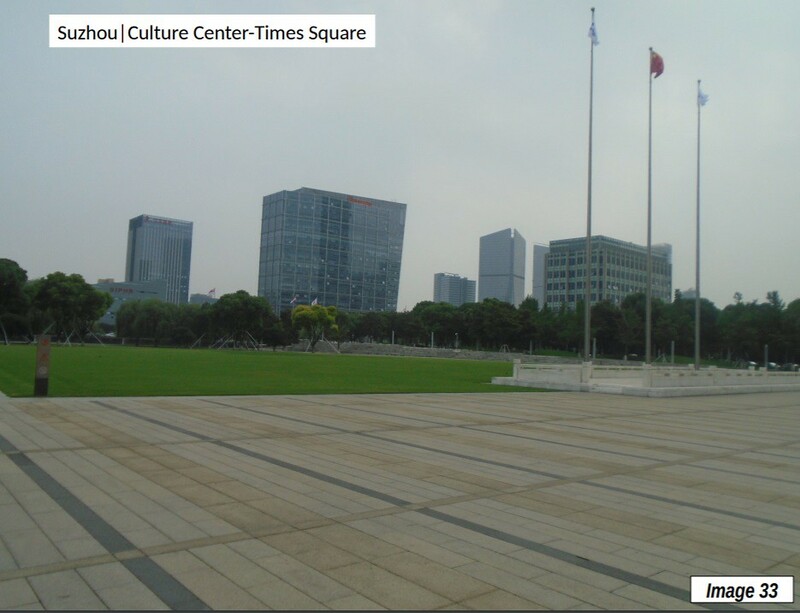 From Suzhou IFS to the east end of the edge city, there are a number of additional buildings, as well as a large plaza midway along the route. 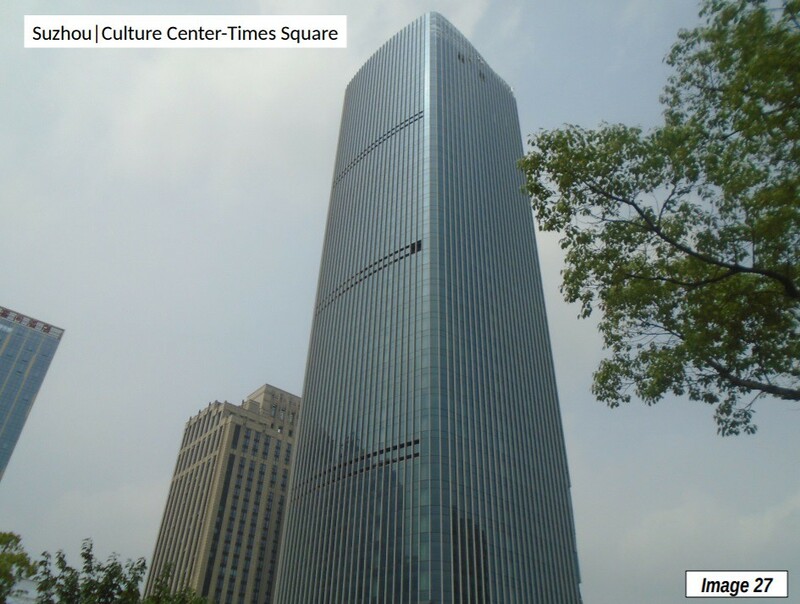 The distinctively designed Hilton Hotel is the eastern end of the edge city, at the Nansha Street station (Image 40). Bumsoo Lee, now at the University of Illinois (Champaign-Urbana) and Peter Gordon (University of Southern California) showed that only a decade after Garreau’s analysis most US metropolitan employment was dispersed well beyond the CBDs and even the edge cities (see: Dispersed American Urban Form Yields Quick Work Trips). 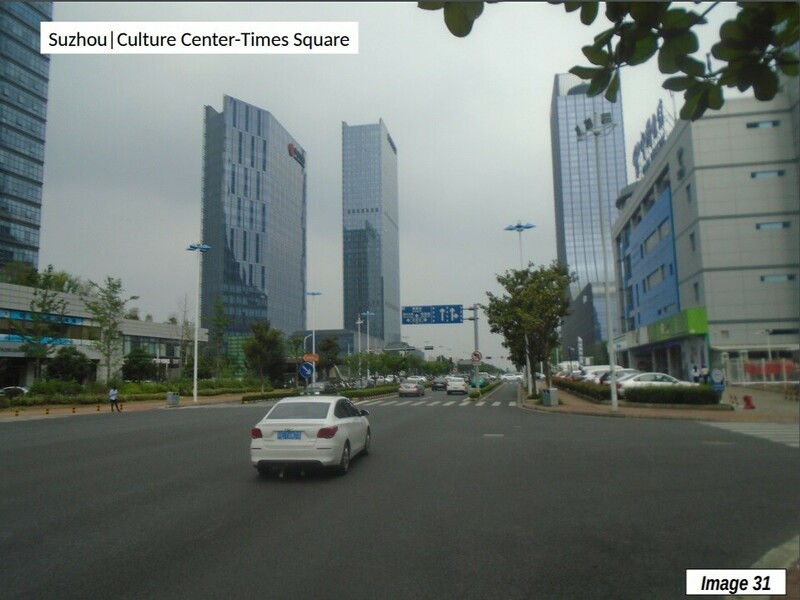 Similar research was not found for China, but from observing its urban form and noting the industrial edge city research (Note 3), China is clearly trending toward greater employment dispersion. 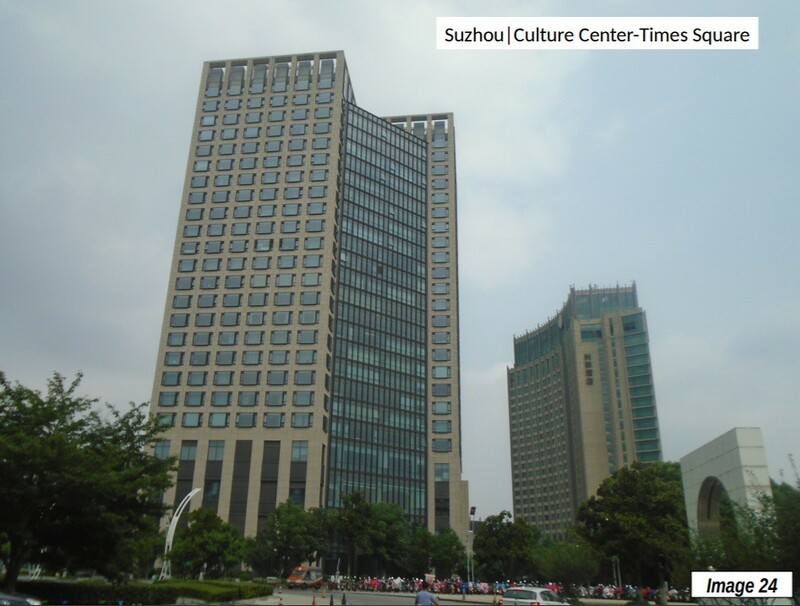 Photograph: IFS Building, Cultural Center-Times Square edge city, Suzhou (by author). All photography by author except Image 4. Note 1: Garreau defined Edge cities has having (1) More than 5 million square feet (465,000 square meters) of leasable space, (2) More than 600,000 square feet (56,000 square meters) of leasable retail space, has more jobs than bedrooms, (4) “is perceived by the population as one place” and (5) “was nothing like “city” as recently as 30 years ago.” Garreau further notes that each Edge city is larger than downtown Portland, Oregon or Tampa. His four principal examples were (1) the Route 128 (now Interstate 95) corridor in metropolitan Boston, (2) Schaumburg in metropolitan Chicago, (3) Perimeter Center in metropolitan Atlanta, and (4) Orange County’s Irvine in metropolitan Los Angeles (Page 5, Edge Cities). 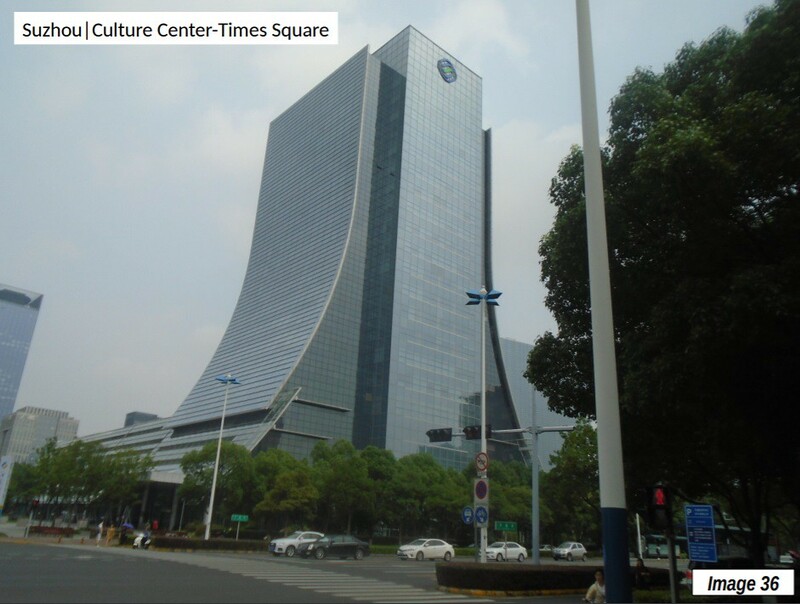 Note 3: There is an important research paper on industrial edge cities by Siqi Zheng of the Massachusetts Institute of Technology, Weizeng Sun of Jinan University, Jianfeng Wu of Fudan University and Matthew E. Kahn of the University of Southern California. 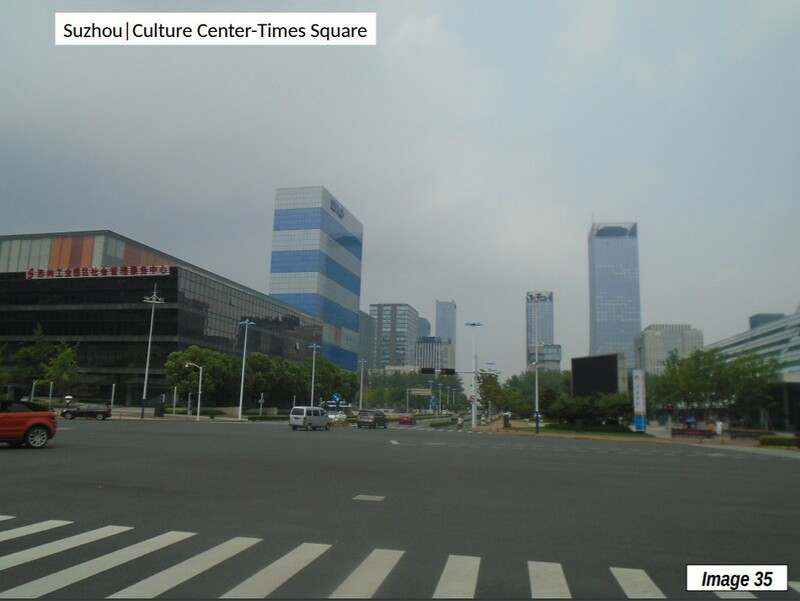 They examine 120 industrial edge cities in just 8 Chinese cities that had developed more than a decade ago. The paper includes maps showing their locations. Submitted by Wendell Cox on Mon, 10/01/2018 - 12:16. Downtown used to be the CBD. I agree that the CBD moved to Makati long ago, but is still an edge city. It replaced downtown in that function long ago. The decline of downtown as the CBD was probably accelerated by the move for nearly three decades of the national capital to Quezon City (1948). 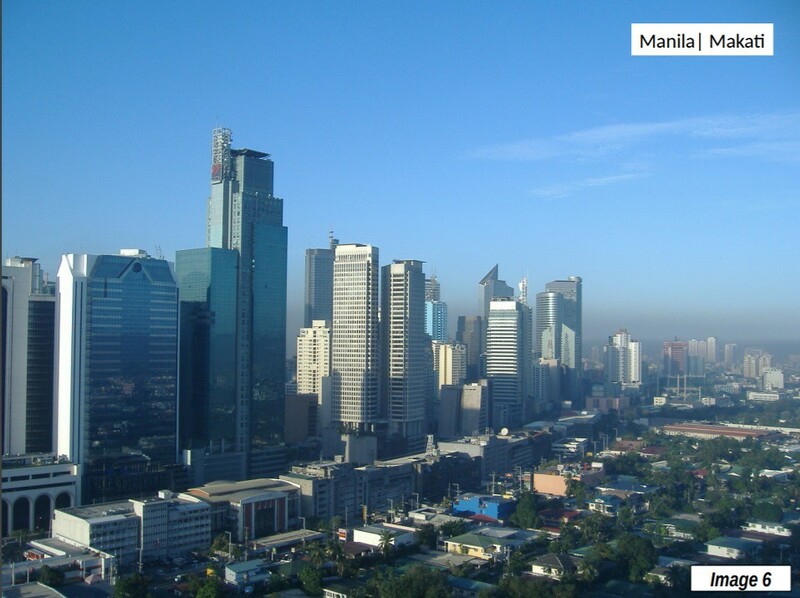 Makati is built more like a CBD, with much denser building construction, as a few other edge cities are. 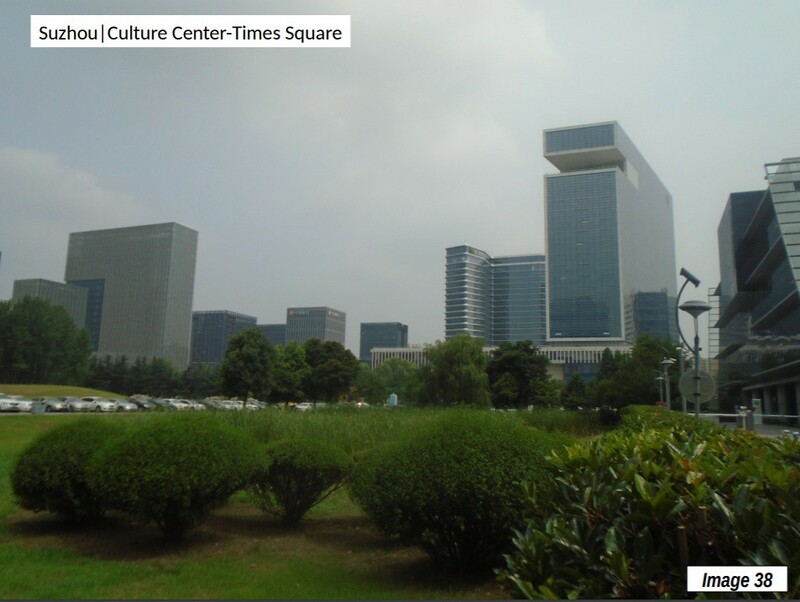 At the same, Tyson’s and similar centers (as you suggest) are more typically what people think of as edge cities. 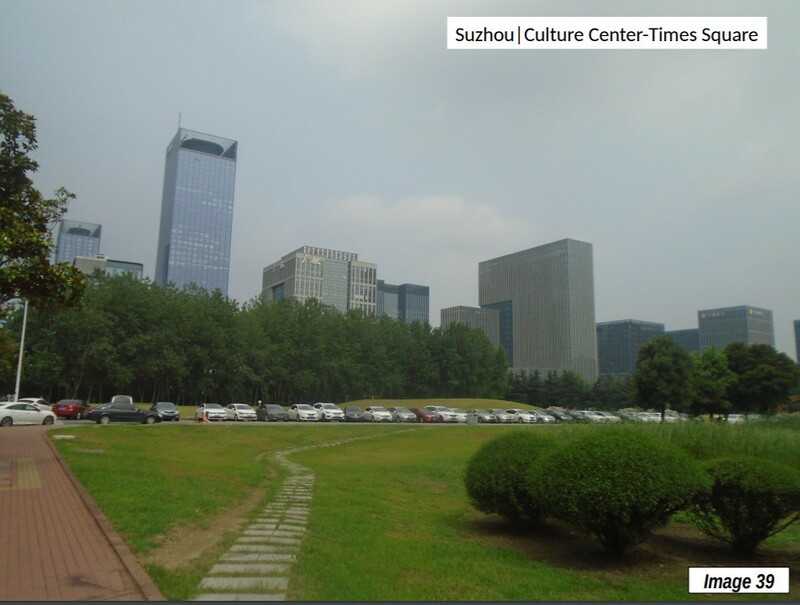 Moreover, edge cities do not need to be suburban. For example, one of Garreau’s examples in the book is Mid-Town in Atlanta, which is within walking distance of downtown. Submitted by Daniel Jelski on Wed, 09/26/2018 - 14:42. My recollection of Garreau's book is the archetypal edge city was Tyson's Corners--that is, someplace way out in the boonies. Similarly, when I think of Chicago edge cities, places like Shaumburg, Skokie (at Golf Rd. interchange), and Naperville come to mind--not North Michigan Avenue. So I don't get your description of Manila. Makati is, in fact, the CBD--by no reasonable stretch can it be called an edge city. The original Spanish city was in Intramuros, which is today mostly a museum. The galleon trade depended on the Chinese, both then and now concentrated in Quiapo and Binondo. Perhaps Binondo could be thought of as the old CBD, but it's so small and crowded that it really doesn't rise to the occasion today. (Though I think it's still the location of the stock exchange.) Other contenders are Ermita and Mabini, but those were never really commercial districts. Business happens in Makati--that's "downtown" Manila. For Manila edge cities (insofar as the category applies at all), I think you'd need to go to Meycauayan, in Bulacan, or perhaps Quezon City out by the University, or maybe Pasay (by the airport). I suspect you'll find something similar in Cavite, or Alabang, or somewhere out the South Expressway--but I've never been to those places so I can't tell you. Submitted by Daniel Jelski on Thu, 09/27/2018 - 12:35. I looked it up on Wikipedia, and the current Philippine Stock Exchange is now located in Makati--just where you'd expect. But I'm pretty sure when I first visited the city in 1985, it could then be found in Binondo.